There are also some huge archives containing a lot of coloured Creatures for Creatures, Creatures 2, Creatures 3 and Docking Station and a forum called Amanora's Creatures Board. 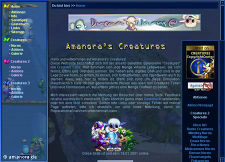 At January 18th, 2001 Amanora's Creatures went online after a long time of improving. At that time this wasn't entirely a Creaturespage but I've put many other things on it, everything that I was interested in. Many pages where under construction and disappered without ever containing any content. Later I seperated the Creaturespage from the others and designed a bit more "nornish" layout for the Creaturespages. 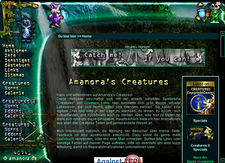 You can see this first standalone version of Amanora's Creatures on this screenshot above. And this were also the genesis of my three mascots! But also the time of endless moving from one free server to the other. At that time I wasn't really very proficient with HTML or the originalities of the different browsers and screen resolutions. So it wasn't very amazing that this first version could only be viewed properly with the Internet Explorer and a resolution of 1024x768. 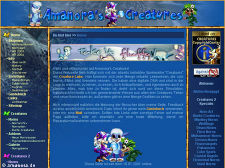 The first design was online quite a long time, I think it was online the longest of all ;-) Anyhow one day I decided to create a completely new layout with frames. I put the whole frameset in a window with fixed dimensions so that the backgrounds stayed where they were. This solution was not the best and the alternative was an iframe. Unfortunately Netscape 4.x isn't able to display these frames, so the whole page wasn't displayed in NS 4.x. This fact was very frustrating and I decided to solve this browser problem with the next redesign. But I had no idea how I should manage this, so I had to accept it this time. I quickly got sick of the second version especially because the old design was not really perfect. After a few months I were enthusiastic enough to deal with the browser problem once more. The reason for this sudden decision was Photoshop because I had played around with it a little bit in the preceeding weeks. With this graphics program I was able to create a design that was very different from the old layouts. The concept for the new page was finished pretty soon but the realisation took a few weeks. The work was worth it, because not only was I able to create a beautiful new design but I also was able so solve the browser problem. Although I was content with the new page, I started shortly after finishing the redesign a complete update of the sourcecode. After the many updates and changes there were many mistakes and errors within the code which weren't actually too obtrusive but still annoying to me. I spent a few additional weeks to revise every single HTML file, a work that wasn't visible on the website itself. Version 4 looked pretty much like version 3, as you can see on the screeshots. In fact I hadn't changed so much in the layout, only a few variances in coloration. Additionally I changed the resolution of the layout: version 4 was the first layout compatible with a resolution of 800 x 600. At that time I wasn't sure if I should customise the resolution because this would reduce the space for text and images. I wasn't sure if there would be enough space for all my content. Luckily there was still enough place than I had to work on every HTML file. As always I changed a few things in between. Because Amanora's Creatures was still growing and so became more and more complex, I had to update the navigation and added the "Info" and "Misc" sections. Generally I was very content with this layout, at least till July 2004. As you can see this is the fifth version of Amanora's Creatures. It's very different to versions 3 and 4 and more like the layout in version 2. I returned to the iframes because in the meantime many new browsers were released, and now only Netscape 4.x isn't able to display these frames. Because of this I've created a fullscreen version for all the netscape 4.x users (believe it or not, they're not extinct yet *g*) and people which are using a 800 x 600 resolution. The navigation has been simplified and is almost restricted to the left frame for the first time. Because there wasn't enough space for the whole navigation I had to create an expandable one - I hope it'll work well. Finally I was able to link the path displayed in the head of every page which was not possible before. So this is Version 6 of Amanora's Creatures. I created it rather soon after Version 5, because I learned a thing or two about PHP in the meantime, for example includes, which I couldn't resist using. Once again, I sticked with my beloved blue and tried to further simplify the page. A very positive side effect of the new design is the absence of frames, meaning that it is possible to direktly link to subpages from forums or newsboards. I probably will be using even more PHP in the future, as it is a wonderful alternative to Java Script and frames. This page was last modified on 31 May 2016, at 01:37.